Fox Racing: New V1 Helmet Graphics! Looking to be the cat’s meow at the starting line? Want your buddies to be jealous of your impeccable moto style on the trail this weekend? 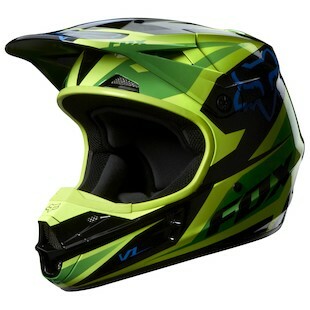 Fox Racing has what you need with 4 new graphics versions of the already popular V1 helmet. The Fox V1 Creepin Helmet will have you creepin past the competition through the whoops section. With 10 intake and 4 exhaust vents for enhanced airflow, you’ll be looking and keeping cool as you launch off of the Grandstand double jump in front of packed bleachers. The Fox V1 Race Helmet comes in 5 different color options to match your bike whether your riding a Honda, Yamaha or KTM. Plus 3 shell sizes and 4 EPS sizes for a precise fit along with a Dual density EPS liner will keep the helmet comfortable during a 30 minute moto or 2 hour hare scramble. Want to be seen as you pull a Superman over the finish line table top? 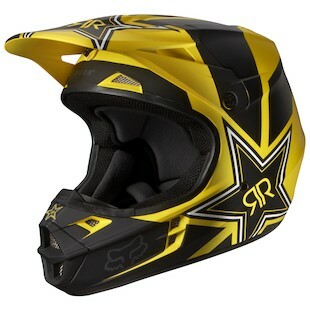 Then the Fox V1 Rockstar Helmet colorway is what you need. Plus with a lightweight injection molded polycarbonate shell, you don’t have to worry about extra weight holding you down. Rock on! With classic brand styling, the Fox V1 Radeon Helmet finishes up the new releases for the V1 in 2013. With the Snell 2010 certification, you can get the confidence needed to hold the throttle open a little longer off the gate for the holeshot or turn a double into a triple and grab the checkered flag. 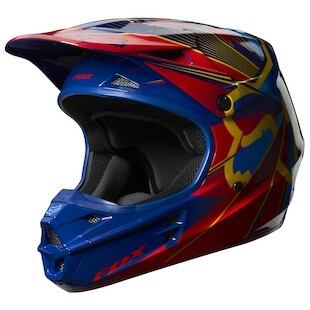 We hope you are as stoked as we are to get our hands on these new helmets and kick up some roost!